On this page you can listen to samples of all the songs on our album, purchase an album or read a review of one of our performances. CDs are available, and downloads are waiting for you at iTunes, CD Baby and Amazon. The album was recorded and mixed by Techno Sound Studio in Baton Rouge, LA. The album’s graphic artwork was designed by Stark Imagery Digital Design. Please list any comments concerning your experience with Nouveaux Cajun Xpress, positive or constructive. After having a great time playing for her wedding reception August 29, 2015, we were so pleased to receive the following note of thanks from the bride. Y’all were absolutely amazing. Our family, friends, vendors had nothing but great things to say about the music and entertainment y’all provided for us. Even the bartenders thanked us for not picking a boring cover band that they usually are stuck with haha! They said y’all were extremely refreshing to their ears :). I truly felt like I have known you guys for a long time. I could not have asked for a better band at my wedding. The day was absolutely perfect and I wish I could do it again just to dance the day away to you guys jamming out :). Thanks again for the love and fun you provided for us. I will get on the website this weekend and leave a great review in which y’all truly deserve. Nouveaux Cajun Xpress is an amazing band, filled with talented musicians who played an integral role in making my reception a success! First off, John and Butch were straightforward and honest in their dealings, and were also a pleasure to work with. From organizing the logistics to discussing the song selection, everything was easily planned out. It’s nice to work with people who are gifted and truly passionate about what they do. The entire band was gracious, enthusiastic, professional and gave a special flair to my reception. Nouveaux Cajun Xpress is not your typical wedding reception band – I booked them because I wanted something different, something special and some good ol’ fashioned authentic Cajun/Swamp Pop music – and they delivered. From bringing washboards and encouraging my guests to play along with the band, to performing a Zydeco version of “Boogie Shoes”, my guests and I are left with wonderful, lasting memories of a fun and unique reception. I still continue to receive many compliments from guests of all ages about what a wonderful band Nouveaux Cajun Xpress is. Thank you Nouveaux Cajun Xpress for sharing your talents, making beautiful music, and bringing joy to those who listen! We were able to “Laissez les bon temps rouler” all thanks to you! Click on the following picture to read another review by Danielle Edmonson with Chef John Folse Events and White Oak Plantation. We have worked with them on several events and look forward to many more. Review from Mary Tauzin: Master Gardener’s Assoc. You guys were fantastic; so much more than we expected. 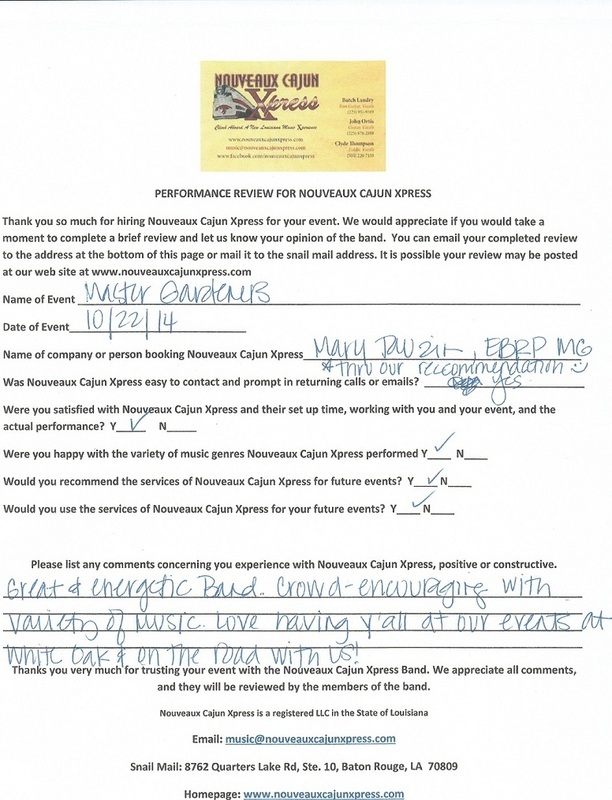 We expected good Cajun music, but you added personality and caring that invited people to be a part of the entertainment. Thank you so much for such a wonderful performance. It was a pleasure getting to know such a great group of guys as well. Feel free to offer me as a reference if you ever need one.